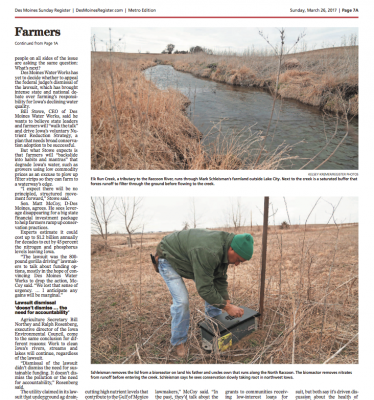 Recall that back in January, a FarmPolicyNews update discussed an important legal case in Iowa that challenged the general exemption for agricultural storm water discharges under the Clean Water Act, among other issues. The Iowa Supreme Court ruled on a portion of the case in January, and earlier this month, a federal judge dismissed the case. Today’s update provides a brief overview of some portions of the Iowa case and notes that water related issues still lurk in the future for agricultural producers. Back on March 18th, Donnelle Eller reported on the front page of The Des Moines Register that, “A federal judge has dismissed Des Moines Water Works’ lawsuit against drainage districts in three northern Iowa counties the utility claimed are funneling high levels of nitrates into the Raccoon River, a source of drinking water for 500,000 central Iowa residents. 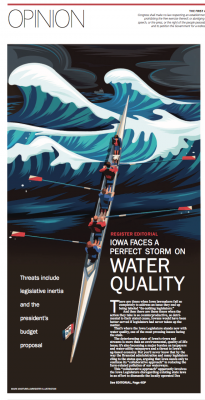 “Federal Judge Leonard Strand dismissed all of Water Works’ claims against drainage districts in Sac, Buena Vista and Calhoun counties, determining that Iowa’s water quality problems are an issue for the Iowa legislature to resolve. The Des Moines utility sought to have the drainage districts, and indirectly farmers, regulated under the federal Clean Water Act as a ‘point source’ of pollution, much like businesses and manufacturing plants. Procedurally, the Register article indicated that, “[Federal Judge] Strand sided with the Iowa Supreme Court, which ruled in January that Des Moines Water Works could not obtain damages from north Iowa drainage districts to reimburse the utility for the cost of cleaning excess nitrates from the water. “Through a rare procedural move known as a ‘certified question,’ state Supreme Court justices were asked to tackle questions about state law before the federal judge issued a decision. The article added that, “Ralph Rosenberg, director of the Iowa Environmental Council, agreed the state — from lawmakers to Gov. Terry Branstad — faces more pressure to ‘step up’ and address water quality challenges. DTN writer Todd Neeley reported on March 17th that, “The [federal] court ruled drainage districts lack the authority to redress DMWW’s claims, meaning the utility has no standing to sue drainage districts. 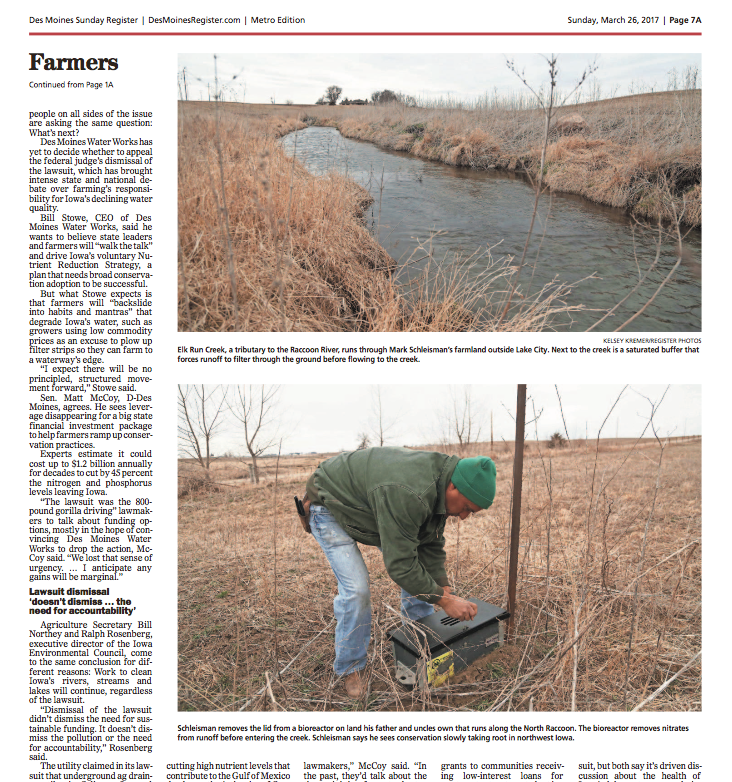 Writing on the front page of Sunday’s Des Moines Register, Donnelle Eller reported that, “Farmer Mark Schleisman firmly believes that Des Moines Water Works’ decision to sue over high nitrate levels in the Raccoon River was the wrong way to get more farmers to embrace conservation practices across Iowa’s 26 million corn and soybean acres. An article on the front page of Sunday’s Des Moines Register discussed the unresolved issues associated with water regulation from a recent court case. After the lawsuit’s dismissal, people on all sides of the issue are asking the same question: What’s next? “Carol Balvanz, policy director at the Iowa Soybean Association, said state budget shortfalls — $249 million this fiscal year, with $131 million covered by reserves — make significant water-quality funding this year tough,” the article said. Water quality issues and conservation policy will likely continue to be an issue that lawmakers in Iowa and other farm states continue to grapple with. And at the federal level, the Trump administration has indicated a desire to cut the Environmental Protection Agency budget by 31 percent, and the U.S. Department of Agriculture discretionary budget by 21 percent, which could put further pressure on the debate.